Great Prices are offered on the Fujitsu range of air conditioning units. Fujitsu are an established name in the air conditioning industry, complimenting their reputation for quality in consumer products. They offer reliable air conditioning equipment at very competitive prices representing excellent value for money. Energy Ratings are frequently better than alternative higher priced comparable equipment and can result in reduced running costs. 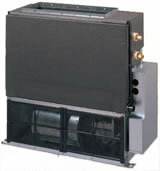 Besides complete systems, we are able to offer spare parts, replacement fan coil units or condensing units.